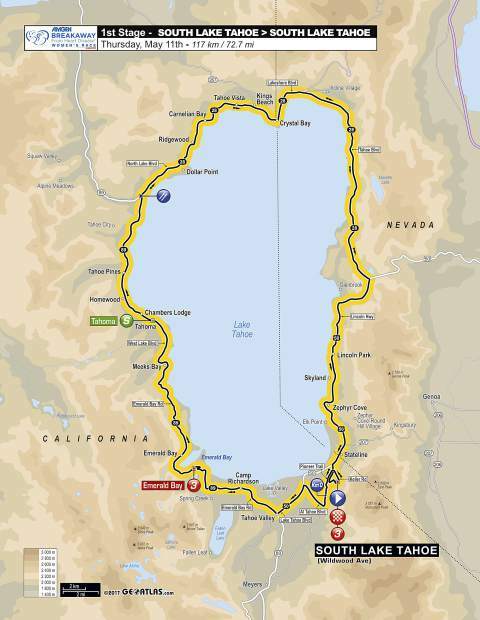 The route for day one of the women's race, on May 11, will circle Lake Tahoe. Visit www.amgentourofcalifornia.com/stages to learn more about the routes, and the Amgen races overall. SOUTH LAKE TAHOE, Calif. — Amgen Tour of California officials on Tuesday unveiled the full routes for its 2017 races, including the Lake Tahoe stages for the women’s competition. The first two stages, set for May 11-12, of the four-stage Amgen Breakaway from Heart Disease Women’s Race will run the 72-mile circumference of the lake on day one; with the highest summit in race history at Luther Pass and the debut of Daggett Pass along Kingsbury Grade state Route 207 highlighting day two, according to a press release. Amgen Tour of California is entering its 12th year in existence. South Lake Tahoe hosted a potion of both a men’s and women’s stage in 2016. Prior to that, the city hosted two stages of the women’s race in 2015. A men’s stage was canceled due to snowy and cold weather in May 2011. Amgen is a Union Cycliste International sanctioned race, which signifies the highest level for a non-World Cup event, according to the press release. The routes, including those around Lake Tahoe, will challenge the world’s top female cyclists — an international field that will include Olympians, Tour de France contenders and World Champions, race presenter AEG announced. The women’s race will include the overall start (May 11) and Stage 2 (May 12) on consecutive days starting and ending in South Lake Tahoe. The competition will continue with Stage 3 in Elk Grove (May 13) and the finale in Sacramento (May 14) as the seven-day men’s Amgen Tour of California begins. 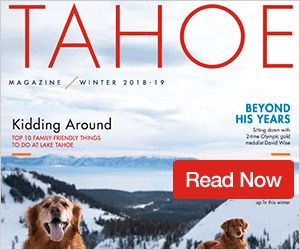 Stage 1 will circumnavigate the 72-mile shoreline of Lake Tahoe clockwise starting at Heavenly Mountain Resort, passing through South Lake Tahoe, Emerald Bay and Tahoe City. Racers will enter Nevada on the North Shore and ride through Incline Village. The stage will feature two sprints, 5,300 feet of elevation gain and two Queen of the Mountain (QOM) challenges where riders vie for a separate jersey by completing the climbs in the lowest cumulative time. The final stretch will feature a brutal ascent back to the finish at Heavenly Mountain Resort. 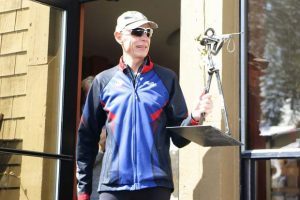 Spectators can expect a select group of competitors fighting their way to the finish before going on to Stage 2, which will feature a new 61.7-mile race course that includes the highest peak in event history. 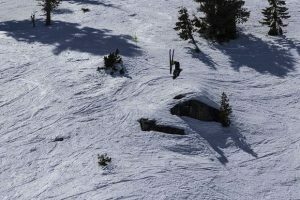 Racers will start at Heavenly Mountain Resort, head west through Meyers, and then south on State Route 89 racing over Luther Pass, the tallest summit at 7,740 feet. Luther is the first of three QOMs for Stage 2. A quick descent while exceeding 50 mph through Hope Valley along the Carson River Basin will follow. Riders will then travel around Washoe Reservation before heading northeast into Nevada along Highway 88 before bending west onto State Route 206 Foothill Road. A left turn will take them north on Kingsbury Grade, an 8-mile climb that gains 2,700 feet in elevation. The second QOM peaks at 7,400 feet. A high-speed descent back to South Lake Tahoe follows, with the third and final QOM for Stage 2 at the Heavenly Mountain Resort finish line. Fans can expect a group of five to 10 women fighting their way to the end with riders trailing in for the 15 minutes.